If It's Too Loud...: Refrigerator - "Cardboard Death Elevator"
I feel like I should remember Refrigerator much more than I do. They were active back in the mid to late 90's, which were my glory days of going to shows and college radio. Instead, their name sounds familiar, and maybe I played them on my radio show? The only good thing is I have a LOT of history to catch up on. 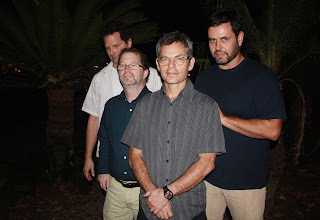 Refrigerator is set to release their eleventh album next month. "Cardboard Death Elevator" is the first song from that album. It's a great mixture of singer/songwriter fare mixed with minimalist noise rock. It starts out with a bare minimum of instrumentation, with an occasionally strummed guitar and and even more occasional piano flourish over a quiet beat, with Dennis Callaci's vocals being the main focus. It does eventually morph into a swirling guitar crescendo, which provides a huge relief, but even that is fairly quiet and minimal. Overall, it's an awkward, haunting song that won't be for everyone. But, if this sounds like your thing, you'll end up loving this. You can listen to "Cardboard Death Elevator" below. Refrigerator's new album, High Desert Lows, will be out February 9 on Shrimper/Revolver. It can be pre-ordered here. For more on Refrigerator, check them out on Facebook.